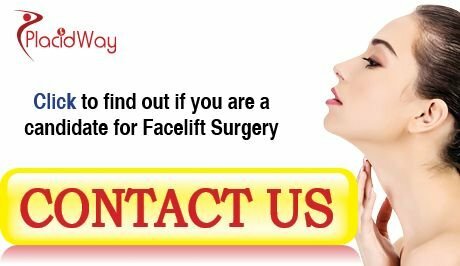 Any face-lift, or rhytidectomy treatment or procedure is considered cosmetic surgery. It is generally sought as a procedure to help improve the visible signs of aging in the face and neck area. A facelift may help to improve sagging; creases, and loss of muscle tone, as well as reduce the appearance of loose skin or fatty deposits in the jaw or neck area. While a facelift offers many years of benefits, it is not designed, nor can it, halt the aging process. A facelift is a surgical procedure, and is an option that contains optimal benefits for non-smokers, those who are physically healthy, and those who have a positive outlook as well as realistic goals when it comes to results. Facelift procedures will benefit those showing signs of aging through deep creases along the nose and down to the mouth, creases below lower eyelids, and through loss of muscle tone in the jaw area that creates the appearance of jowls. Patients are evaluated by a cosmetic or plastic surgeon to determine specific goals or outcomes of the surgical procedure you choose, as well as your current medical condition, overall health, and lifestyle habits. Facelift results are generally long lasting, though patients should be advised that swelling and puffiness might affect appearance for several months. It may also take up to six months for incision lines to fade and disappear. Patients who undergo facelift procedures are often encouraged to maintain a healthy lifestyle and to avoid excessive sun exposure in order to enhance and prolong the benefits of the procedure. However, the traditional facelift may incorporate a limited incision facelift or a neck lift. The traditional facelift incision is made near the hairline at the temples and extends around the ears to end at the lower scalp area. Fat is redistributed and underlying tissues repositioned. Excess skin is trimmed away. Sutures or other types of skin adhesives will close the incision. A limited incision facelift involves shorter incisions that are made at the temple area and extend around the bottom of the ear toward the back of the scalp. A neck lift incision is made around at the bottom of the ear and down to the back of the lower scalp area. This procedure is optimal for those who wish to address sagging jaws or loose neck skin under the chin. With any of these procedures, patients should expect swelling and bruising for a short period of time. Some risks are attached to facelift procedures, including infection, scarring, and facial nerve injury or skin discoloration. Patients should discuss benefits as well as risks with their plastic surgeon before agreeing to any method or procedure. In the United States, cosmetic surgical procedures are generally not covered under health insurance plans because they are considered elective surgeries. In the United States, the average cost of a full facelift can range between $6,000 and $15,000. This cost includes anesthesia as well as facility fees. Depending on location, a full facelift may even cost up to $25,000! In South Africa, the same procedure costs $1,250. The same goes for costs in India and Thailand, where costs run a tenth of fees charged in the US and the UK. Cosmetic surgery costs in Argentina, Brazil, Costa Rica, Columbia, and European destinations such as Turkey, Poland and Slovakia also cost much less, though treatments are highly advanced in the use of state-of-the-art equipment as well as facilities. The American Society for Aesthetic Plastic Surgery recommends that anyone seeking cosmetic surgery take the time to research various procedures, understand the process, and search out highly qualified and certified physicians to perform their procedures. A cosmetic or plastic surgeon should have at least five years of surgical training and at least two years of training and experience in plastic surgical procedures. The Joint Commission International accredits many international facilities. A doctor, no matter where they live, should operate only in accredited medical facilities and fulfill quality standards in medical education requirements. Cosmetic and plastic surgeons from around the world should be board certified by medically accredited boards, associations, or organizations in their country of origin. If you want to know more, you can always contact us and ask for more info, or get a free quote. Cosmetic/Plastic Surgery - Cosmetic/Plastic Surgery, PlacidWay, 2017-11-17 Find everything about cosmetic and plastic surgery to make an informed decision. PlacidWay can help you access top plastic surgery clinics and surgeons abroad.